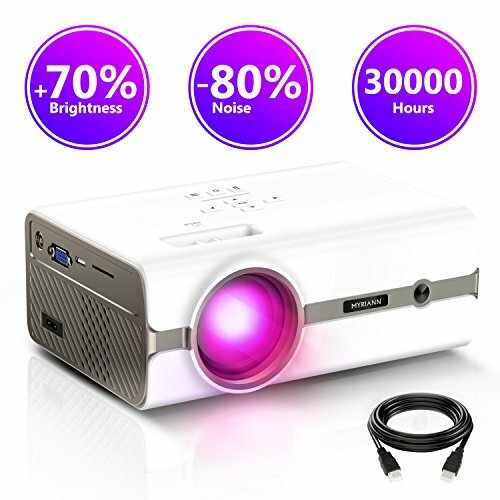 Home video projector provide 50 ~ 130 inches large projection size to you for better visual experience, just feel like you are in a cinema. HD 1080P LED Projector is about 20% brighter then the regular mini projector, Low Power Consumption, Durable and Energy Saving, latest smart ECO Lamp care technology ensure the LED bulb inside can save energy up to 70%. A considerate holiday gifts for your family and friends, especially ideal for family gatherings and parties, home cinema, TV shows, football nights, video games, outdoor activities. 【ENJOY YOUR PORTABLE HOME THEATER】Light Weight and Simple Operation. Ideal for Home Entertainment like Movie Time, Parties, Sports Events, TV Series and Video Games, turns your life into minimalist style. Enable you to take it to anywhere you want, great kit for family time. 【ADVANCED PROJECTION TECHNOLOGY】33"~170" projector distance & size and 800x480p high native resolution. Built-in new upgraded sound cavity and mega bass subwoofer makes voice more stereo and clear. Can provide sharp picture in dark environment. (Does not support Dolby sound). 【MULTIPLE DEVICES CONNECTION】This home projector provide AV / VGA / USB / SD / HDMI interface. You may connect it to your PC / Smartphone / Tablet / DVD / PS3 / Xbox / TV box / U-disk / hard disk. AV and HDMI cables are included in the package. 【LOW ENERGY CONSERVATION】Upgraded LED lighting provide high luminous efficiency. Low Power Consumption and Durable, latest smart ECO lamp care technology ensure the energy saving up to 70% and long lasting lamp life for more than 50000 hrs. High cooling efficiency and low fans noise. 【12-MONTH WARRANTY】Customer satisfaction is our top priority which is why each Myriann product comes with 12-month warranty. If you have any questions about this product by MYRIANN, contact us by completing and submitting the form below. If you are looking for a specif part number, please include it with your message.